This kit was the subject of one of the Buckeye Scale Auto Club's famous "same kit night" contests. Everybody in the club gets the same kit and then we have a contest to see who can come up with the most unique variation. The club got a sweet deal on these old AMT Ford Courier kits that year and here's what I built. 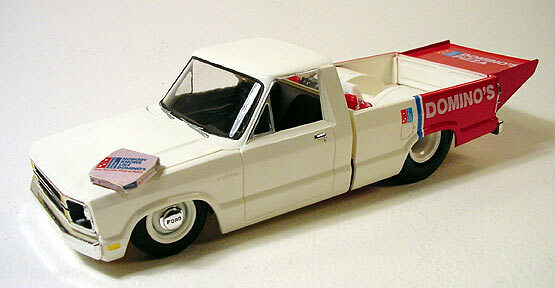 The kit reminded me of the trucks Domino's pizza use to have as pizza delivery vehicles. They use to have this marketing gimmick about getting it to you in 30 minutes or it was free. I thought it would be cool to make a pro street truck to ensure it got there on time. I used various drag car bits from the parts box and scratch built the rear wing. The decals came from the Ertl Domino's Indy car kit. The scale pizza box was folded up from a photo reduced copy. The twin nitrous bottles are labeled "extra sauce".